The pictures above are taken from the intersection of Marin Blvd (aka Hendersen St) and 9th Street looking north-west - the main facade of the building is facing 9th Street. 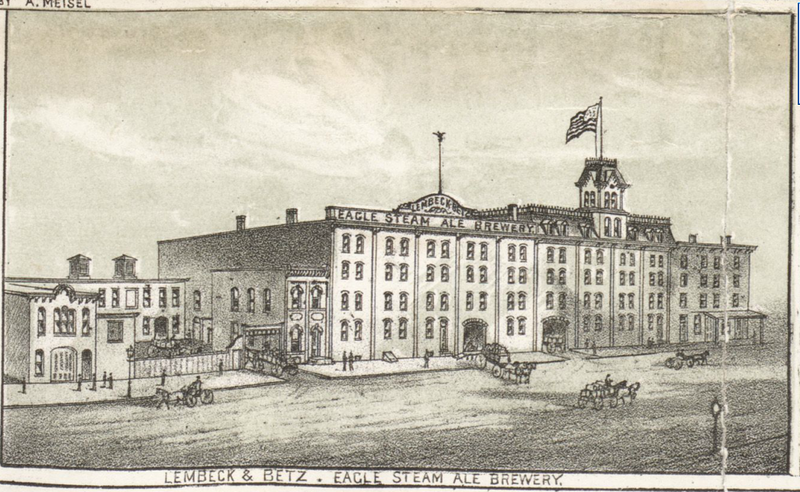 The brewery was the Lembeck & Betz Brewery and the complex was built in phases, from 1869 onwards, took up more than one city block, dried up during the prohibition but stood for more than 100 years, was put on the National Register of Historic places and was then demolished by the City of Jersey City in 1997. 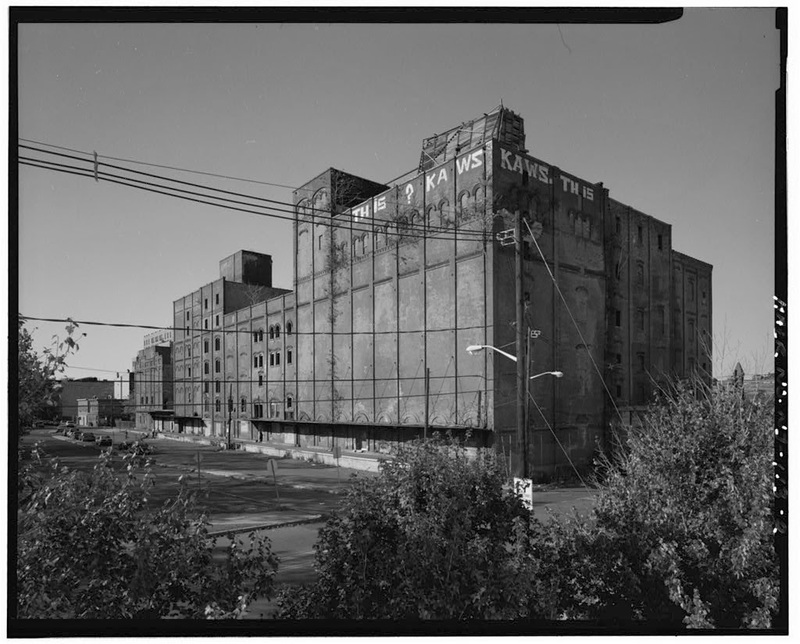 The City of Jersey City owned the building (after the previous owner defaulted on taxes) when it was put on the National Register of Historic Places 1980s - a few years after Van Vorst and Hamilton Park areas were added to the register. 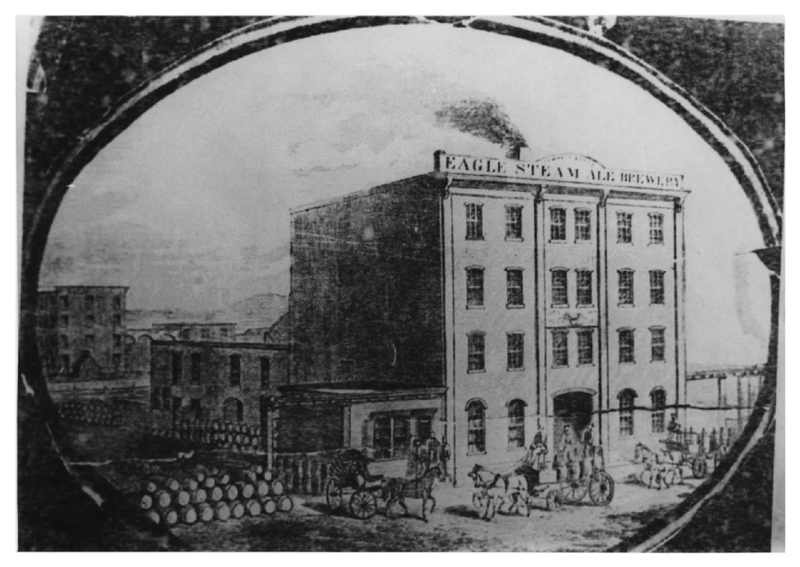 The image below is from the application for the national register. In the distance one can see the storage buildings / warehouses (I believe owned by Swift Co./Sioux Pork) what used to stand where the Newport Mall parking garage is now located. Only places of national importance are added to the National Register of Historic Places. Being on the register should in theory provide some protection from inappropriate changes and even demolition. But while Jersey City owned the buildings they were not protected in any meaningful way. In the 1990s, the City of Jersey City, engaged a local architect on a consulting retainer and bought a report that declared that the buildings were structurally unsound. Even though I did not have the chance to visit the complex before it was demolished I find it hard to believe that all the buildings that made up the complex were so deteriorated that there was no other option than to demolish all of them : the complex was developed over several decades and individual buildings were added and extended at various points. That somehow every single building that made up the complex had become so structurally unsound, between the time that they were added to the National Register in 1984 and 1994, that there was no way to save any of them seems improbable. 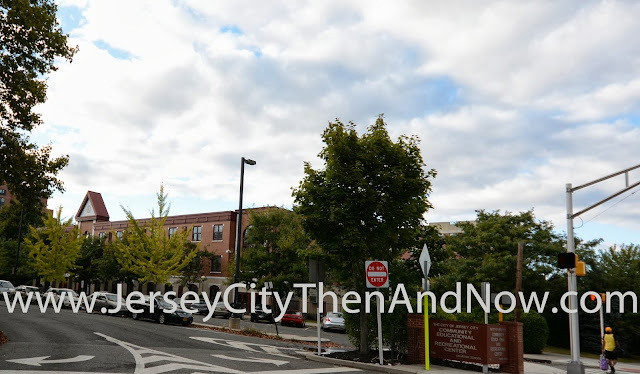 But the consultant's report provided the City of Jersey City with the evidence it sought to, in 1994, convince the 'New Jersey Historic Sites Council' to support a request from Jersey City to allow the demolition of the historic site - and so was done in 1997. 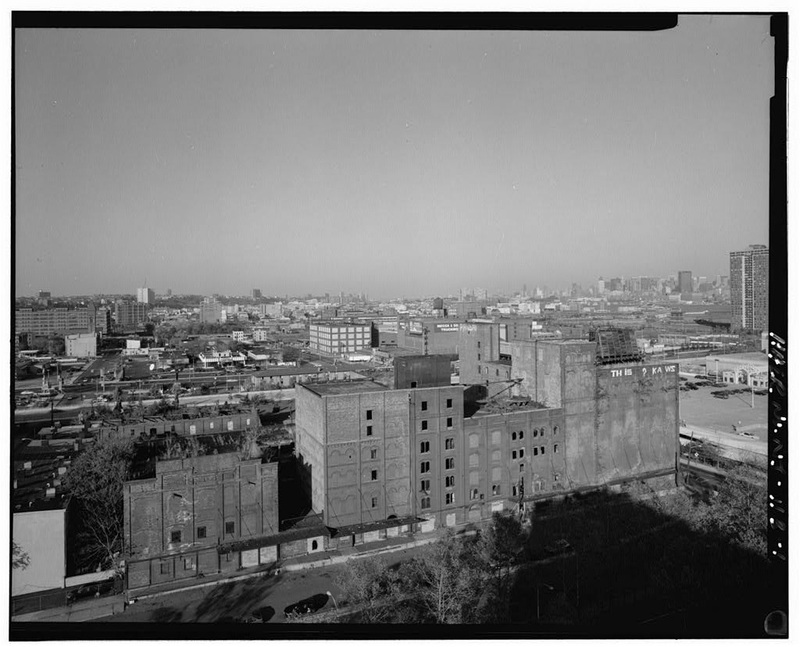 This is what the Lembeck & Betz complex looked like in 1997, right before demolition. 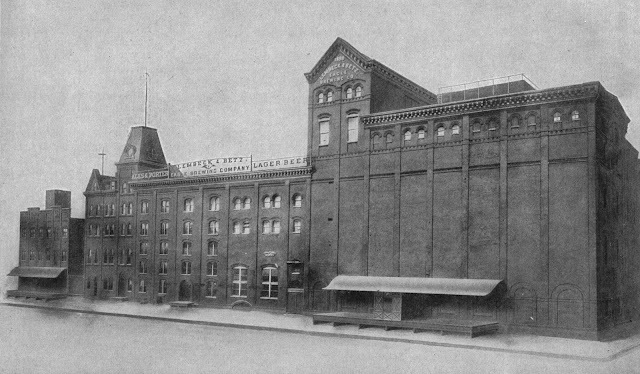 After demolition the historic brewery was was replaced by an uninspiring three story structure. 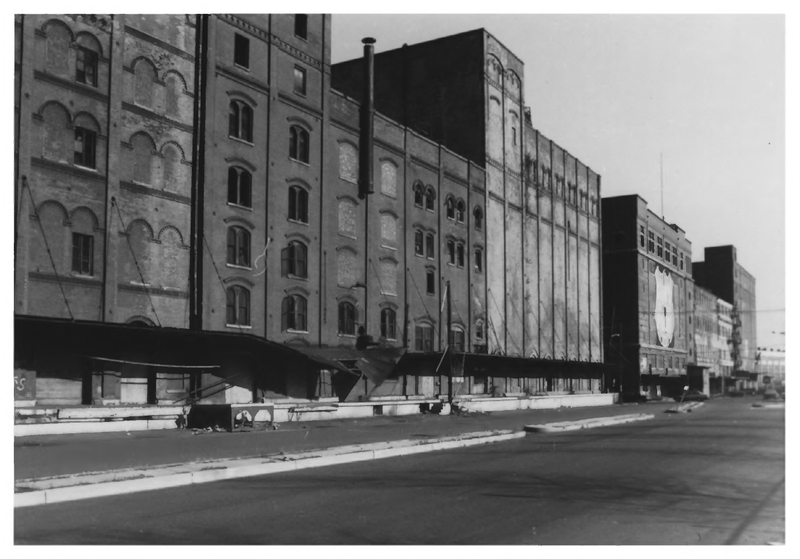 I am sorry for the negative tone in this post - but I think that the destruction of the historic brewery is such a wasted opportunity. I can understand that vacant buildings were demolished in the 60s through 80s when people were leaving Jersey City in droves - Jersey City was at that time a very different place compared to today. But in the late 90s the rebirth of downtown Jersey City was already under way. To completely demolish a historic complex of national significance and then shortly thereafter replace it with a bland building with a similar foot print is incredibly short sighted. Instead of tearing down and building new, could not some of the buildings that amounted to the required square footage have been kept and rehabilitated to regain some of the historic character? The demolition was not even done by a profit motivated developer. It was done by the elected officials / administrators at the City of Jersey City itself - that ostensibly are meant put the city's best long term interest first. I just hope that we learn from mistakes and that the Jersey City Power House (that has also been put on the National Register of Historic Places and is currently vacant) does not face a similar destiny and instead that it's potential as a focal point for the community is realized. 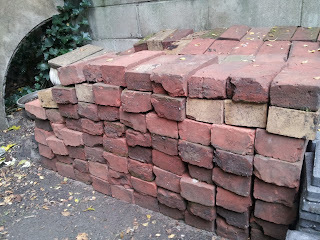 When we were redoing our backyard brick patio, my neighbor, a lifelong Jersey City resident, told me that the previous owner of the house had got the patio bricks from the demolition rubble of the Lembeck & Betz brewery site. 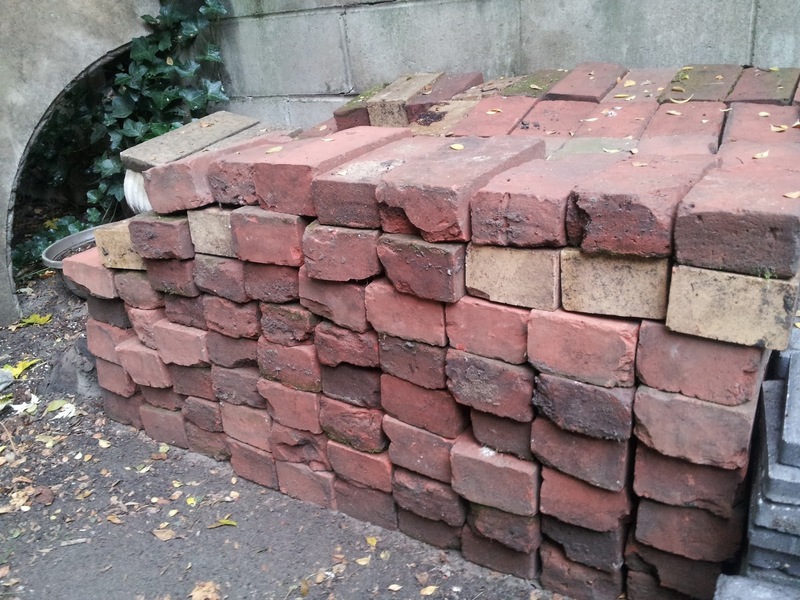 Apparently many other residents in the Hamilton Park area also picked up bricks from the site : there are patios, brick fire pits and the likes across the neighborhood made from reclaimed bricks from the brewery. The old picture from the slider is from the book "Jersey City of Today - its History, People, Trades, Commerce and Industries" that was published in 1909 and available on Smithsonian Libraries. Just wanted to say that I've been perusing your site for over an hour and I think it's fantastic! As I moved to Jersey City earlier this year, I'm having an even greater appreciation with my new community given its rich history and historic sites. Keep up the good work! I currently live on the corner of Jersey Ave. and 2nd St., so any "Then and Now" pics would be greatly greatly appreciated! Excellent post. I had read about the brewery but this really fills in a lot. Also I had wondered where that KAWS tag was. Thank you. Thanks for the kind comments! I'll try to post something new (and old) in the next week, stay tuned. The loss of the Brewery was tragic. Many of us at the time tried to stop it's demolition. But it became apparent that it was a done deal before we found out about it's demolition. 20 or more years later, it's loss is even greater when you take into consider what that building would mean to the community if it was still in place. Thanks Bill! Any family connection? If you want to keep it private please send me a message on bloggeradmin@jerseycitythenandnow.com.